November 20th, 2015. Gaming achievements tracker Exophase has uploaded a complete list of all 57 trophies in the English-language edition of Digimon Story: Cyber Sleuth. Readers should beware that the descriptions for some of the chapter trophies contain storyline spoilers, including several major plot points that were only implied in the Japanese trophy list. The list also confirms the final translations for several stats in the game. What up to now has been called the "Potential" stat, which limits how many bonus points a Digimon can earn to one of its stats through farm training, is called Ability (ABI) in the English localization, and the "Friendship" stat is Camaraderie (CAM). 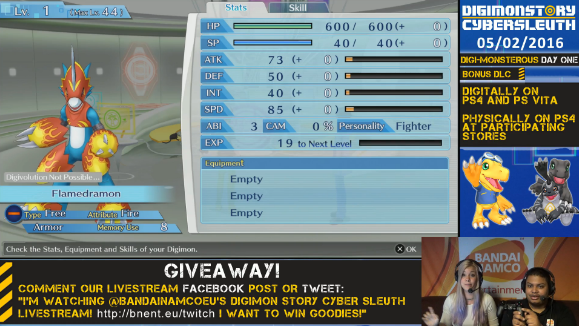 These names were previously shown in Bandai EU's European stream of Cyber Sleuth held yesterday, but whether the stream's version of the game was the final build or not remains to be seen.